The coverage of Venezuela’s ongoing crisis often tells a single story of repression and despair. However, looking beyond the headlines to the reality on the ground reveals a much more complex reality. 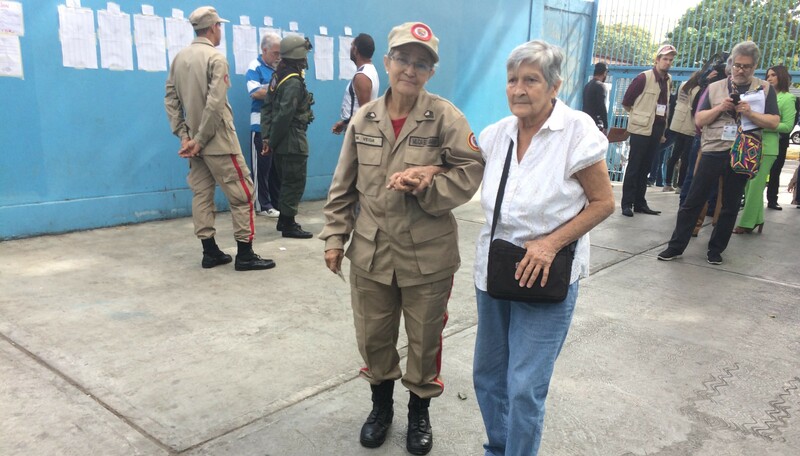 An elderly Venezuelan woman is accompanied to her local polling centre. All photos by Betty Purcell, reprinted with permission. Venezuela is a beautiful, sunny country, with some of the friendliest people I have ever met. But it is also a complicated place. To read much of the Western media, I expected a dour, crisis-ridden society with a population furious at an autocratic government. Instead, when I travelled to the country to observe local and governor elections on December 10th, I met talkative people itching to tell me the good and bad of their lives. On the streets, marketeers sell tomatoes and corn, pineapples and bananas. But there are severe food shortages, including staples like rice and flour, and a chronic lack of medicines. The paradox is that the people who are most affected by these shortages are those least angry with the government. 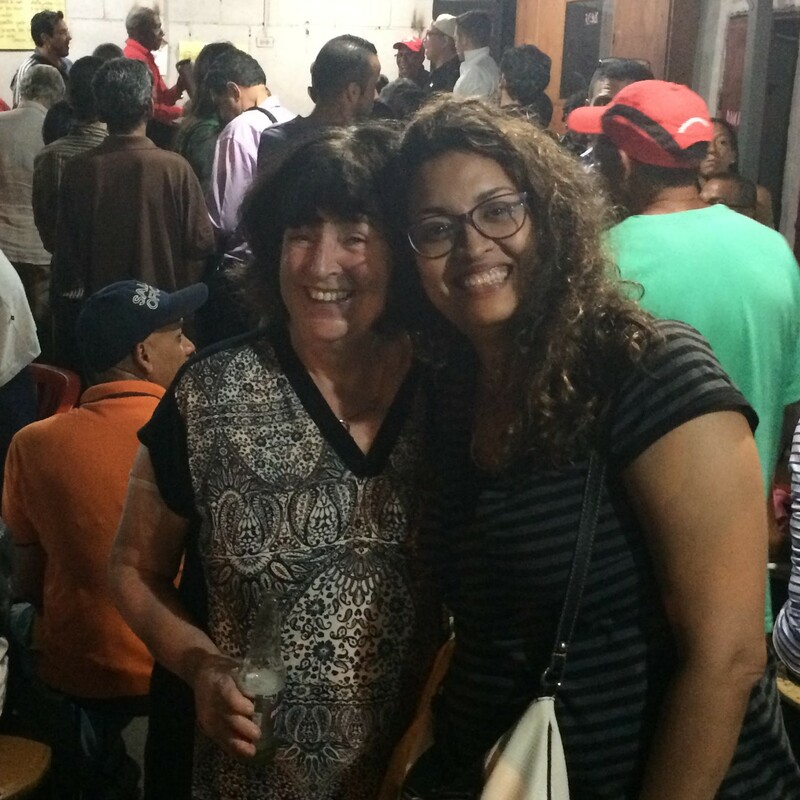 The families of Caracas’s overcrowded barrios voice their support for the socialist government of Nicolas Maduro. It is people in the better-off areas, where the supermarkets have supplies, that are most anxious to tell international journalists of the discomforts of living in Maduro’s Venezuela. One man told me he has to travel to three or four supermarkets to fill his weekly shop. A woman told me with tears in her eyes of the queues to get vital medicines. 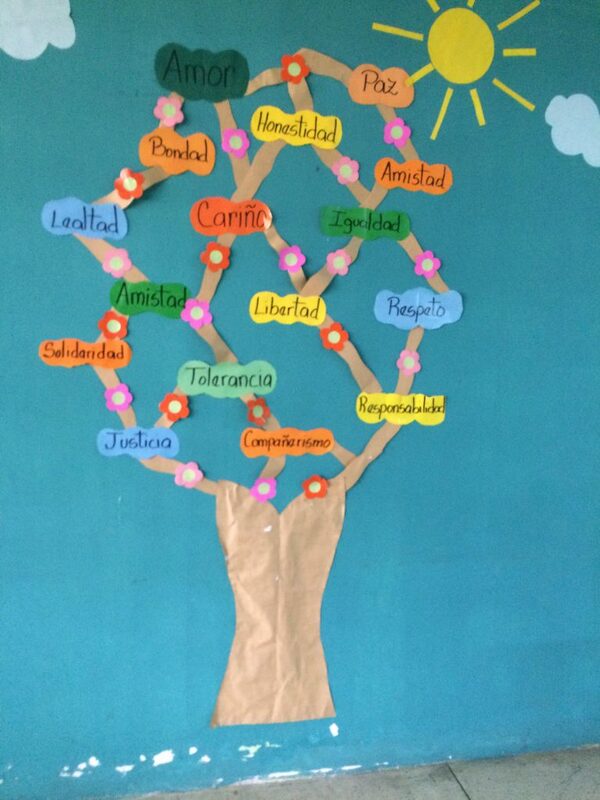 At over 95%, Venezuela has one of the highest literacy rates in Latin America. The reason the barrios are calm is because of an elaborate set of social supports received by the poorer citizens. Six million of Venezuela’s 31 million people receive food parcels to supplement their food every 3 to 4 weeks. Children are fed daily at school, both breakfast and dinner, and school attendance is up from 40% to 90%. Medicines are supplied according to need, albeit with long delays, through local health clinics. There are huge public building programmes, with 500,000 homes built each year. The subsidised social housing blocks feature the familiar signature of Hugo Chavez on their side wall, a reminder of the homelessness many experienced under the old regime. Public transport is good, if crowded, and petrol is almost free. A full tank of petrol costs less than the price of a can of soft drink. As to the causes of the economic hardship, again, analyses differ. What seems incontrovertible is that forces both inside and outside the country, spearheaded by an ideological push from the United States, have inflicted huge hardship on the Venezuelan population through an economic and financial blockade. The statement also notes “multiple errors” in the government’s attempts to counter these economic difficulties, but the poorest citizens are protected through the food parcels distributed by local neighbourhood committees (the CLAPs). 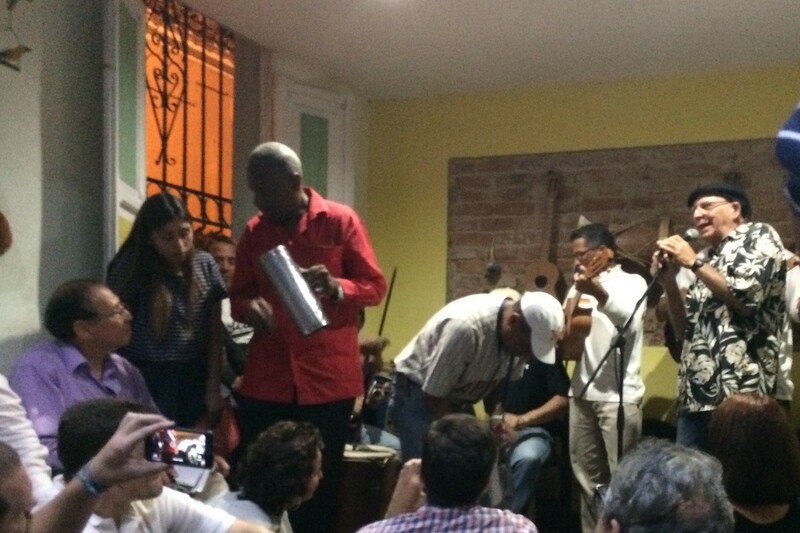 Spending an evening at a music session in the poor barrio of San Augustin, many people spoke to us about the importance of these subsidised food supports. The residents of San Augustín, Caracas, have benefited hugely from Venezuela’s anti-poverty measures – turning the working-class barrio into a bastion of Chavismo. After allegations of election fraud a number of years ago, I was curious to see the operation of the system and how it would work in reality. The body which organizes the elections, the National Electoral Council, showed us the voting machines which electronically transmit the vote of the electorate in great detail. Made in Taiwan, they are triggered by individual fingerprint, making multiple voting impossible. Anonymity is ensured by the separation of the fingerprint from the ballot cast. The voter receives a printed receipt of their vote, which is then placed in a separate ballot box. This allows a paper audit of the electronic vote. Over 50% of votes are audited in this way, as a back up to the electronic vote. 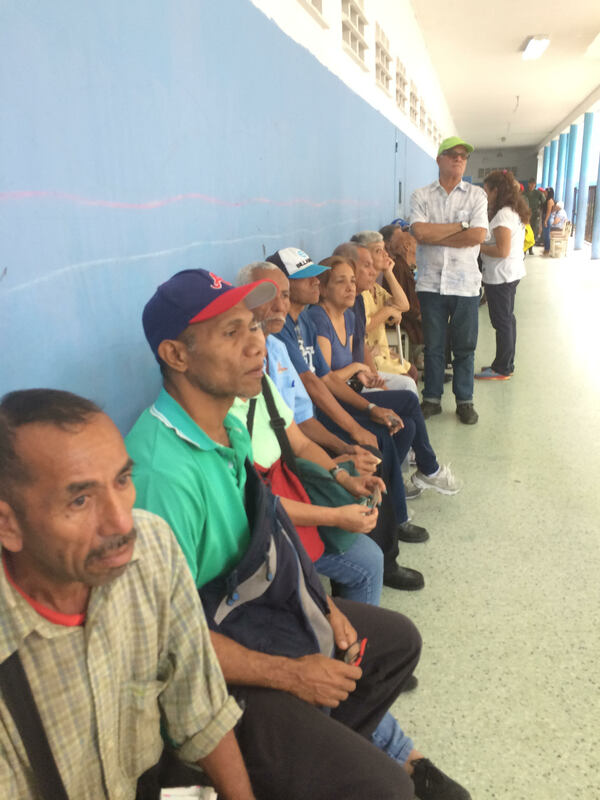 Venezuelans queue inside a polling centre for their turn to cast their vote in the municipal election. It is a sophisticated system, and seems impossible to fraud. In the queues to vote, I spoke to voters for both government and opposition. They told me what they thought. Some anti-government voters were critical of the main opposition parties who were boycotting the election. This left them with less choice as to who they would vote for. Later that evening, after the ballots closed at 6pm, we attended the paper count of the vote, which is observed by witnesses for the candidates running, both government and opposition, and is open to the public. The vote was announced later that evening, after a paper audit of 54% of the boxes, which is carried out at the polling booths across the country. The results were a huge win for the socialist government party, the PSUV. Of 335 mayoralties, they won 305 and the one governor position, in a ‘first past the post’ system. They garnered 70% of votes, while the opposition candidates received 30% of votes. The result was underwritten by a high-level delegation of the Latin American Council of Electoral experts (CEELA), which included former Colombian Electoral Court President Guillermo Reyes, and the former Heads of the Electoral Supreme Courts of Honduras and Peru. They said the election reflected “peacefully and without problems, the will of Venezuelan citizens”. But that’s only part of the story. The observable technical truth of the vote ignores one big issue: the boycott of this election by the major opposition parties. South American journalist and author, John Otis, recently argued that the tactic of not running in these less important elections may leave the opposition undermined when it comes to the crucial presidential elections next year. The opposition, which could represent up to half of the voters, needs to unite around one credible candidate to have a chance of success. At present they are in disarray. Betty Purcell (left) with Caracas resident Marx Caballero. Caracas has the highest homicide rate in the world. It also has its beauty spots. After taking the cable car up to a mountainous walking area above the city, I chatted with families out enjoying the famous hot chocolate of Venezuela. Political arguments are fiercely contested. One couple told me that Maduro’s policies were causing children to starve in the barrios. But they were not from there, they hastily added. Others proudly showed their bags with pictures of Hugo Chavez on them, and said their children could look forward to lives of dignity and progress. As I watched the indoor ice skating and street theatre, it struck me that things are a lot more complicated in Venezuela than we in the West have been led to believe. The presidential election could be held as early as March or April of this year. The world will be watching that contest with real interest. Betty Purcell is a broadcasting journalist, who worked for 33 years in RTÉ. She also produced Vincent Browne with TV3. She is the author of Inside RTÉ (2014) and Light After Darkness: an Experience of Nicaragua (1987). For the last 4 years she has been a Commissioner of the Irish Human Rights and Equality Commission. In 2017, she travelled to Venezuela as part of a group of International observers for its December 10th elections.